I just read an interesting paper on pathogen discovery using next-generation sequencing data, recommended to me by Nick Loman. 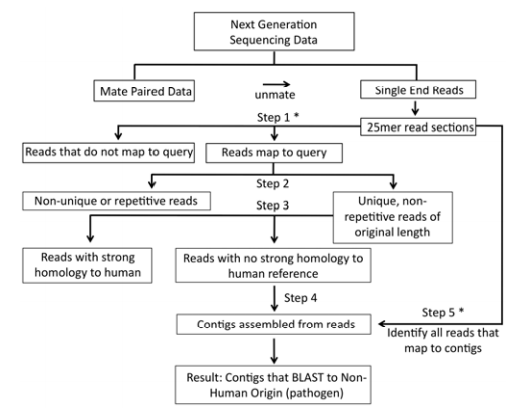 A previously described algorithm (PathSeq, Kostic et al) for discovering microbes by deep-sequencing human tissue uses computational subtraction, whereby the initial collection of reads is depleted of human DNA by consecutive alignment to the human reference using MAQ and BLAST. 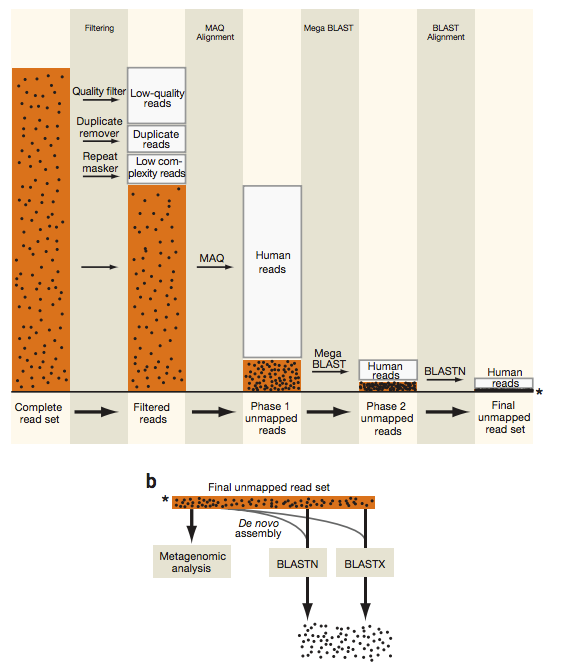 The PathSeq method: computational subtraction by depleting complete read set of all reads mapping to the human reference. The method described here, Rapid Identification of Nonhuman Sequences (RINS), uses and intersection-based workflow rather than computational subtraction. RINS first maps to a user-supplied custom reference (e.g. a collection of all known viruses and bacteria), thereby drastically lowering computational requirements and increasing sensitivity. Contigs are then assembled de novo, and the original reads are then mapped back onto assembled contigs, which increases specificity. The RINS method - uses intersection rather than subtraction to identify non-human reads. The authors of the RINS (intersection) paper noted similar sensitivity and specificity to the PathSeq (subtraction) method in a fraction of the time (2 hours on a desktop machine versus 13 hours on the cloud). The ENCODE project continues to generate massive numbers of data points on how genes are regulated. This data will be of incredible use for understanding the role of genetic variation, both for altering low-level cellular phenotypes (like gene expression or splicing), but also for complex disease phenotypes. 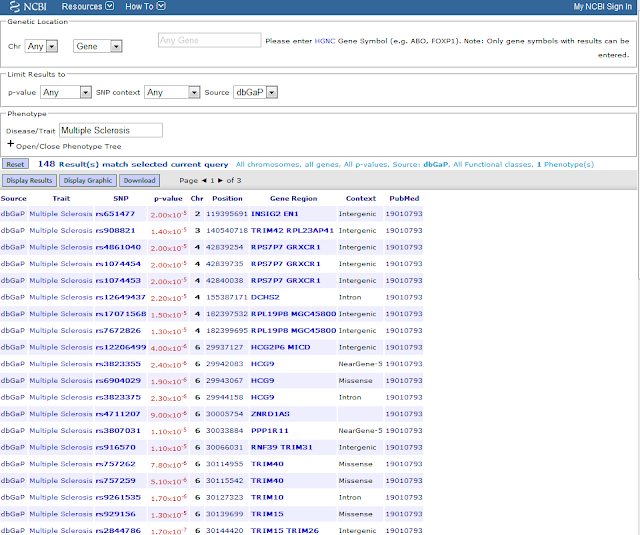 While it is all deposited into the UCSC browser, ENCODE data is not always the easiest to access or manipulate. To make epigenomic tracks from the ENCODE project more accessible for interpretation in the context of new or existing GWAS hits, Luke Ward and Manolis Kellis at the BROAD Institute have developed a database called HaploREG. HaploREG uses LD and SNP information from the 1000 Genomes project to map known genetic variants onto ENCODE data, providing a potential mechanism for SNP influence. HaploREG will annotate SNPs with evolutionary constraint measures, predicted chromatin states, and how SNPs alter the Positional Weight Matrices of known transcription factors. Here's a screenshot from SNP associated with HDL cholesterol levels showing summary information for several SNPs in LD at R2>0.9 in CEU. Clicking each SNP link provides further info. In addition to providing annotations of user-submitted SNPs, HaploREG also provides cross-references from the NHGRI GWAS Catalog, allowing users to explore the mechanisms behind disease associated SNPs. 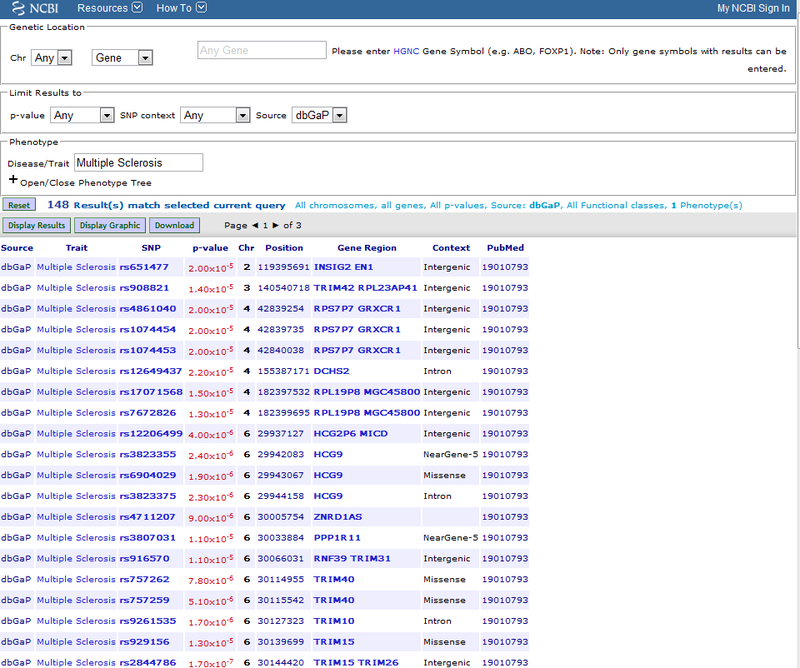 Check out the site here: http://www.broadinstitute.org/mammals/haploreg/haploreg.php and explore the functionality of any SNPs you might find associated in your work. The more functional information we can include in our manuscripts, the more likely they are to be tested in a model system.